Founded in 1952, SYC now has around 200 members who enjoy the many boating activities available on Okanagan Lake. Our boating season runs from March to the end of October. We have an active racing group which hosts the Giant’s Head Regatta in early August, kicking off Okanagan Race Week. Members from every Yacht Club and other marinas on our lake attend. Our members cruise the 80 km length of the lake using reciprocal moorage at six other Yacht Clubs on the lake (See Links). 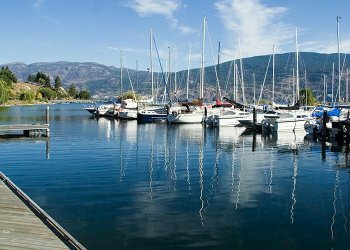 Summerland Yacht Club has events ranging from Lift in/out days, Members Wine and Cheese Night, Commodore’s Ball, Sunday Evening Cook Your Own and our Penticton Regional Hospital Fundraiser, the Great Ogopogo Bathtub Race. Of our four docks, three have 20 amp service and city water. Close to the secure gated entrance way to the docks is a shower and washroom building. We are open 7 days a week during the summer. Our new septic pump out has easy access and works great, no special fittings required. Enjoy the Boathouse Bar and Grill (open to the public), which serves great meals indoors or on our patio. Click on the logo below to visit our Ogopogo Bathtub Race website! Click here to view all the latest news! Click here to access Members Lounge.